Battling freezing temperatures and wind chill that took things down to -23C, Yuki Kawauchi (Saitama Pref. 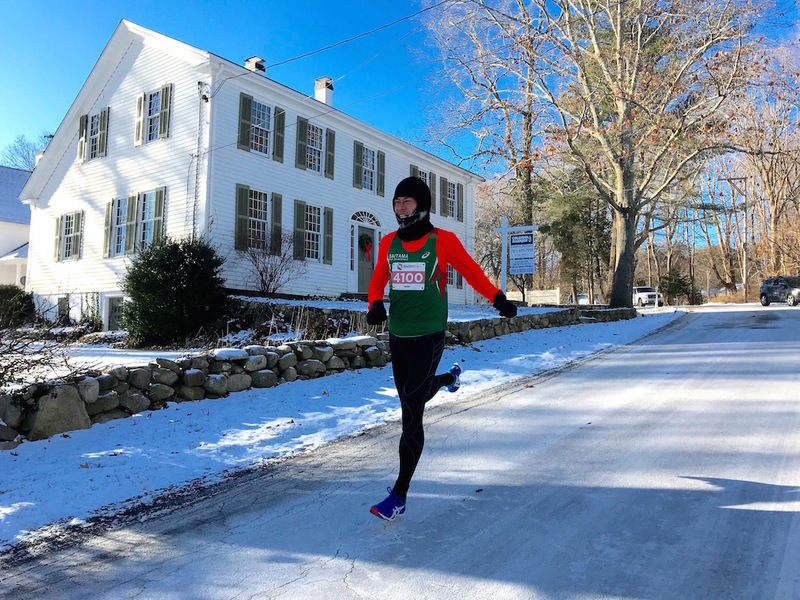 Gov't) ran a 2018 world-leading 2:18:59 at the Marshfield New Year's Day Marathon, taking 30 minutes off the course record and breaking American Doug Kurtis' historic sub-2:20 world record with his 76th career sub-2:20. 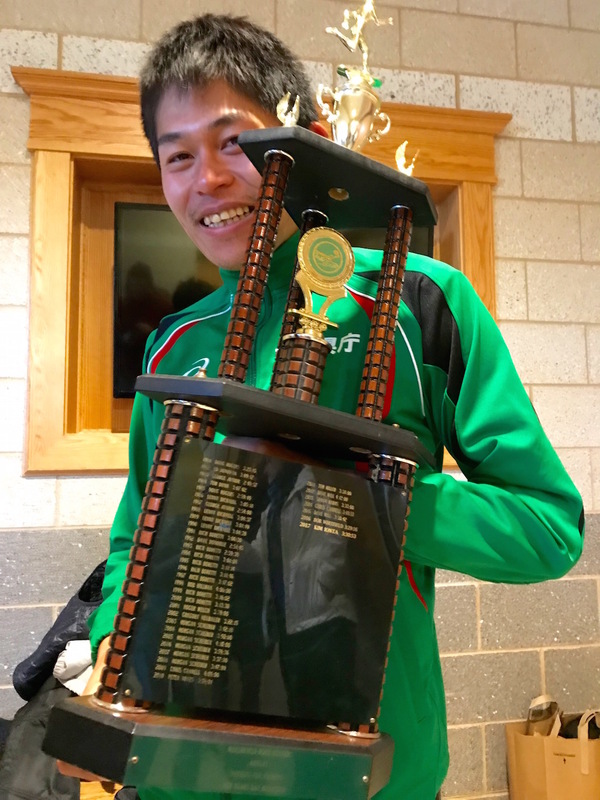 Kawauchi spent Dec. 29 to 31 training on the Boston Marathon course ahead of his upcoming appearance as part of the John Hancock Elite Athlete Team and planned to run Marshfield at the tail end of his trip. The Marshfield Road Runners club, organizers of the marathon, had their longstanding race USATF certified ahead of his appearance. Wearing full-length tights in a marathon for the first time, in Marshfield Kawauchi planned to run the first of the hilly course's two laps in 1:09 flat to give himself room to work with in breaking 2:20. But in the wind and cold he struggled to stay on pace, ice crystals coating his face as he hit halfway in 1:10:29. "At 5 km I was already all alone and so cold that I couldn't move my legs," he said post-race. "When I saw my 5 km split it was the first time in a race I've ever thought, 'Why am I doing this?'" 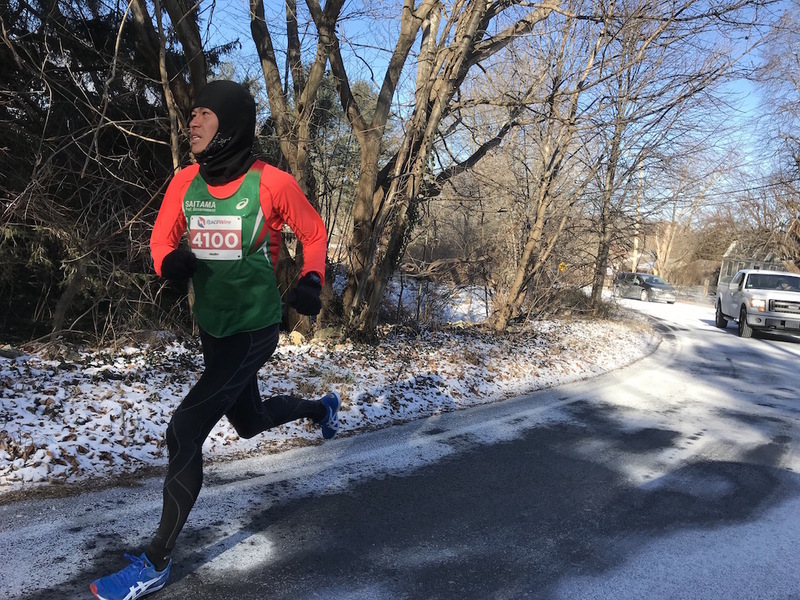 Temperatures warmed slightly as the morning went on, and, aware that he was behind, Kawauchi began to push the pace harder to try to make it up. 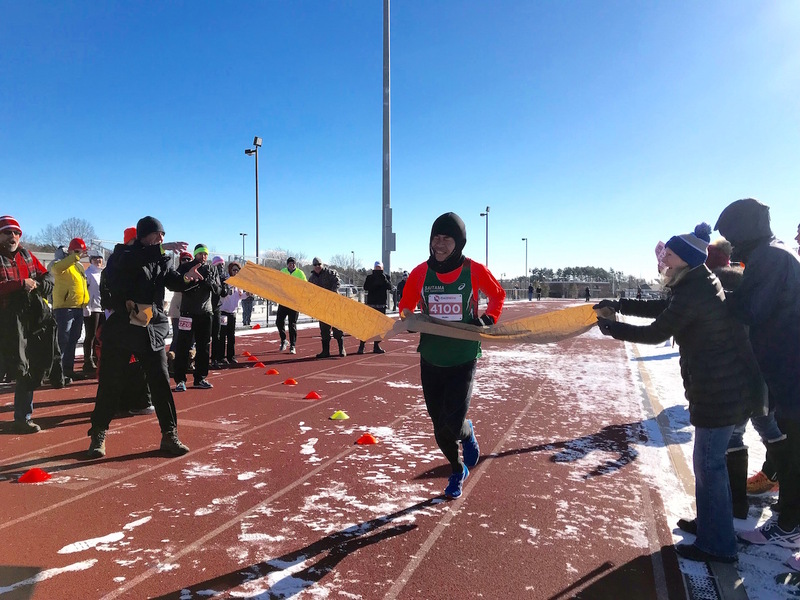 "It was sunny enough that I warmed up a bit and could get into my stride," he said. With at least two clear changes of gear Kawauchi's finish time projection moved just under 2:20:00 by the time he got to 40 km, where he dropped his usual closing surge to fly into the track finish. Almost slipping on ice on the very last corner, Kawauchi crossed the line in the middle of a pack of cheering supporters to stop the clock in 2:18:59, a two-minute negative split. After recovering from the cold inside the nearby high school, Kawauchi told reporters, "At halfway I didn't think I could do it and it seemed like it was going to end up being my slowest marathon ever. But I came all the way to the U.S.A. to do this and the people of Marshfield put in a lot of work to organize everything for me, so I had to do everything I could to live up to my word. These were definitely the coldest conditions I've ever run in. After this I think I could do pretty well going after the Antarctica record." His 76th career sub-2:20, Kawauchi's run in Marshfield surpassed Kurtis' record of 75 that he equalled two weeks ago in Hofu. He now owns the sub-X records for everything from sub-2:12 to sub-2:20. He may well also hold the record for the coldest sub-2:20 ever. After five marathons in the last eight weeks Kawauchi now has some down time before launching his spring marathon season at the Feb. 18 Kitayushu Marathon. In mid-March he will return to Taiwan's Wan Jin Shi Marathon in a tuneup for Boston in April. From here on out every one of these marathons and beyond takes him into uncharted territory where no one has set foot before. It's safe to say none are likely to ever deliver conditions like today's. Post-race Kawauchi told JRN, "Doug Kurtis' record was a big source of motivation for me. I hope that other runners, people who feel like they could never make a national team or run a world record time, will look at my record and say, 'I could do that.' But," he added with a laugh, "the problem for them is I'm going to take it even further first." Very inspiring run by Yuki in quite adverse conditions. Looking forward to his appearance at Boston. The People's Champion! Incredible... was worried when he slipped on the ice! For the first time I was really worried. Can Yuki recover from a marathon that must surely be an assault on his health. Then a week later he runs 1:03 for the half. This is all so far beyond my comprehension, he is a true superhero.